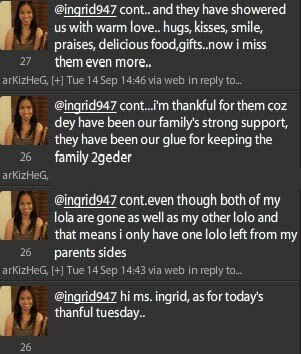 Since we celebrated Grandparents’ Day two days ago, I thought it would still be appropriate to do a Thankful Tuesday special dedicated to our dear Lolos and Lolas. Whether they’re still with us or have gone ahead, I’m sure that they’ve somehow influenced who we are today. My Lola Pines, circa 1970. Some grandparents may appear strict, boring or cranky but for all you know, they just need someone to talk to and spend time with. I enjoy conversing with my two Lolas because I get a lot of godly and practical life wisdom from them. My Nanay Bids loves life quotes. She gathers the quotes, writes them by hand and gives it to us, her grandchildren. My Lola Pines loves it when I tell her stories about what I do at work and how my spiritual journey is. What inspires me about her is that she still leads a group of ladies in weekly Bible study. My Lolo Noli, circa 19?? Both my Lolos have gone ahead, but I am blessed to have spent my teenage years with them. My Lolo Bien was interesting to learn Spanish from because he spoke it so well and I knew he was amused whenever my toddler cousins would come and make mano to him. My Lolo Noli was a man of great faith. In his last years, he influenced me a lot because I saw him “running after God” by seeking Him in His Word and enrolling in short Bible courses. He believed it was never too late to get to know God. MAILA: for the topic.. i am thankful for my lola because she was the one who took care of me and my sister when we were still young.. if not for her lectures and golden rule.. i wouldnt be the nice person i am now..
JP FORTES: im thankful that my lola is celebrating her 87th bday on November, healthy & strong. and her children (my Aunt & Uncle) and grandchildren will be coming home from Australia to celebrate with us. ANGELINA JOLOGS THE GRANDMOTHER’S PET: I’m so thankful to my grandparents (from my mother side) for taking care of me along with my other siblings during our grade and high school days. Since my mother is a teacher and most of the time she’s busy, my grandparents were the ones who accompany us most of the time to our school activities. My grandmother taught me how to be frugal and instilled the value of kindness and family ties. While my grandfather, starting in my high school years, introduced me to the habit of reading the newspaper, listening to news and current events. He is the best person i cud argue about politics because he is a Marcos Loyalist! Dats ol thank u.
JENNAH: for todays thankful tuesday. i grow up not having to know my grandparents side but my siblings did. i want to thank them for the character that they have shown both of my parents, bec. thats what my parents did to us. to always see the best for each one, and be aalways supportive. VIRATA: im thankful to my grandmother because she took good care of us after our parents separated. she nurtured us with her unconditional and genuine love. we would not be as grounded and humble if not because of her. i love and i miss my lola. i am proud to be lola’s boy! RENE PARAS: about ur topic,words cannot express how much im thankful to my lola.she means everything to me.being a retired teacher, she made me what i am today, not the naughty me, but the responsible, lovable and God fearing person that i am today.she may be gone now, but her memories will remain forever as long as i live.i miss her.i miss the times when im with her.but i know she’s happy in heaven right now and watching over me.i love u lola. erwin here, im thankful for my Gparents especially my lola for who im now, they nurturd n raisd me equippd w/ love, good manners, n values whch servd as my guidance in facing lyf, i really owe them alot, my lolo is already in heavn but i still have my lola whom i calld nanay, i love hr so much and now its only fittng to serve her back.